Limerick Civic Trust has warmly welcomed the decision by Limerick City & County Council to award the lease of Culture House at No. 2 Pery Square to the organisation. Councillors approved the proposal for Limerick Civic Trust to transform the building into a visitor attraction at this month’s metropolitan district meeting. The plan is to turn No. 2 Pery Square into a People’s Museum of Limerick. “In preparing our proposal, Limerick Civic Trust consulted with the Waterford Experiences and The Little Museum of Dublin on their offering, experience and operation. We also drew on the collective experience of our Collections Committee, which boasts a former CEO of Shannon Heritage and the HR director of Shannon Development. We believe that a Limerick visitor experience based on stories and items of local interest will be a great addition to the local tourism offering,” he continued. Limerick Civic Trust is hoping the new People’s Museum will open early summer this year. However, they are waiting for a licence giving formal permission to access the building and gardens so they can carry out some essential maintenance works in advance of the opening. In the meantime, the Trust is working on securing working capital, hiring staff and planning the museum’s offering, branding and marketing. ’45 for Valour’ exhibition which was hosted by the Limerick Museum during November has now transferred to Bishop’s Palace, the headquarters of Limerick Civic Trust. Trish Taylor Thompson’s seminal work ’45 for Valour’ honours the forty-five soldiers of Irish descent who were awarded the Victoria Cross for their bravery and heroism during the Great War. A graduate of LSAD, Trish Taylor Thompson’s practice is influenced by the symbolism of botanicals. Through the motif of the common poppy, she explores the importance of remembering. Themes of commemoration and memorial are at the heart of this important work that has stimulated dialogue in addressing the controversy around the wearing of the poppy in Ireland. The forty-five paintings, oil on linen, are a memorial to the soldiers who risked their lives fighting with extraordinary valour and selflessness during wartime. ’45 for Valour’ marks the anniversary of the beginning and the end of World War I. There is also a Limerick connection. Although the majority of the forty-five soldiers were awarded their medals posthumously, two of the Victoria Cross recipients include Limerick born stretcher-bearer Private Michael James O’Rourke who survived the war and died on 6th December 1957 at the age of sixty-nine. Private Henry Edward Kenny was born to Limerick parents in England and died on 6th May 1979 at the age of ninety. The American humanitarian and educator Moina Michael first introduced the idea of the poppy as a symbol of remembrance by selling silk poppies as a means of raising funds for Veterans of War in the United States following their homecoming from WW1. In 1921, her efforts resulted in the poppy being adopted as a symbol of remembrance for war veterans by the American Legion Auxiliary, and by Earl Haig‘s British Legion Appeal Fund (later the Royal British Legion) later that year. Limerick Civic Trust has presented a cache of previously unseen historical papers relating to Limerick to The Glucksman Library at the University of Limerick on behalf of the Pery Family. The recently discovered papers provide rich insight into the social, political and economical landscape of Limerick City and County from the 1500’s to 1800’s. While much of the papers document the life and times of the Pery family which has links with Limerick going back to the early 17th century, they also provide context and evidence to many of the military actions during that time. Two volumes of handwritten correspondence between Edmund Sexten, who was Mayor of Limerick in 1535, and the authorities in Dublin and London provide a wealth of information about the activities of prominent families like the Sextens, Thomonds, O’Briens and Fitzgeralds. A forbear of the Pery’s, Edmund Sexten became the representative of the Tudor monarch and a major local beneficiary of the dissolution of the monasteries in 1538. Limerick Civic Trust has a long-standing relationship with the Glucksman Library and previously presented its Oral History Archive to the Library in 2015. Account and commonplace book of 172 pages, bound in coarse leather, kept and compiled by Colonel Edmund Pery (d. 1721) between 1671 and 1681. The first part of the book contains brief memoranda of financial transactions, mainly monies lent to and borrowed from various individuals. In addition to accounts, the book contains ‘A Collection of Several things fit to be knowne’. These include notes on weights and measures; a list of foreign coins and their value in pounds, shillings and pence; various conversion tables; and a list of the countries of the known world and their acreage. There are several pages of explanations of terms of scientific nature, particularly relating to geography, topography, astronomy, physics, and mathematics. Hardcover tenement valuation book with index of the estate of the Earl of Limerick for counties Limerick, Cork and Clare, dated 8 August 1884. The right hand pages have been numbered consecutively from 1 to 147, while the left-hand pages bear no pagination. The entries have been arranged first by county and then by ward or townland, as follows. For County Limerick: Abbey Ward; Castle Ward; Custom House Ward; Dock Ward; Market Ward; Shannon Ward; Glentworth Ward; Irishtown Ward; South Suburb Ward; and Knockainy. For County Clare: Kilkishen; Cloontra; Cloghera; and Quin. For County Cork: Kilmacleine; Ballyclogh; Mallow; Blackrock Ward; Caherduggan; and Bawncross. The Attorney General, Seamus Woulfe, will be the guest speaker at our hugely popular festive business lunch. This lunch always provides a great setting to entertain clients and network. Places are limited, so please book before it’s too late. Seamus Woulfe S.C., Attorney General, was awarded a BA (Mod) (Legal Science) from Trinity College Dublin in 1984. He then obtained an LLM Degree from Dalhousie University in Canada in 1986. In 1987, he was awarded the Barrister-at-Law degree from the Honorable Society of King’s Inns, Dublin and began practising at the Bar in October 1987. He was a part-time Lecturer in Law at Trinity College Dublin from 1987 to 1992, and was called to the Inner Bar in March 2005. His practice was of a general nature, mainly in the area of civil, public and commercial law. He also acted as Legal Assessor for regulatory bodies such as the Medical Council, the Nursing and Midwifery Board, the Pharmaceutical Society and the Teaching Council of Ireland, among others. He continued practise as a Senior Counsel from 2005 until his appointment as Attorney General on 14 June 2017. A special paving stone will be laid in Limerick to commemorate Michael James O’Rourke, a Limerick man who received a Victoria Cross for his efforts in World War 1. Limerick Civic Trust presented the VC Paver to the Mayor [today] at a special reception in St Munchin’s Church, King’s Island just a few days in advance of the centenary of Armistice Day. Private Michael James O’Rourke, who in his early adult life moved to British Columbia, Canada, was awarded the Victoria Cross and Military Medal for extreme acts of valour whilst serving with the Columbian Regiment, Canadian Infantry in WW1. Unlike many holders of the VC, Michael survived the war and settled in Vancouver British Columbia. Over the last four years, the specially-commissioned stones have been laid at the birth places of Victoria Cross recipients. Every Irish-born soldier who won a Victoria Cross in the First World War is to have a paving stone erected in their honour. Michael was the only recipient from Limerick. The VC Paver was officially received into the City by The Mayor of Limerick City and Council, Cllr James Collins, followed by a Dedication Ceremony and Act of Remembrance. The official reception, hosted by Limerick Civic Trust, was attended by members of the 12th Battalion from Sarsfield Barracks, the Limerick branch of the Royal British Legion (RBL) and representatives from Limerick City and County Council. David O’Brien, Limerick Civic Trust, said, “I would like to acknowledge the trojan efforts of Brian Duffy, Chairman of the RBL for ensuring the delivery of the VC Paver. Michael O’Rourke was an extraordinary man who displayed incredible courage and bravery in a war that has affected all our lives today. The sacrifice he made deserves to be honoured and it is only fitting to have a VC Paver installed in the hometown of his birth and upbringing so he can be remembered. The location of where the VC Paver will be laid has yet to be decided. 30 October 2018: Urban Design expert Professor Peter Bishop will travel from London to talk about the concept of liveable cities, planning and thoughtful place-making at the penultimate lecture in the Limerick Civic Trust’s Lecture Series. Peter is a Professor of Urban Design at The Bartlett School of Architecture, University College London and a Director at Allies and Morrison Architects, will deliver his talk “The City as a Mirage, designing for impermanence in an era of change and flux” on Thursday 1 November at St Munchin’s Church, King’s Island, Limerick. Other speakers in the series included; Web Summit founder Paddy Cosgrave, Emma Kennedy, Kennedy Analysis and Colonel Colm Doyle. Conor O’Clery, journalist and writer, completes the line-up. He will share his unique perspective on Russia and Putin’s influence at the last lecture on 15 November. Proceeds from the series will be used by the Limerick Civic Trust for the conversion of St. Munchin’s Church into a military museum. On October 25, Colonel Colm Doyle will deliver his address entitled ‘Responsibility to Protect: Sovereignty via Intervention’ at the third lecture in our Lecture Series taking place in St Munchin’s Church, King’s Island. Lecture starts at 8pm and admission is €10 or concessions €8 per lecture. Tickets are also available from The Limerick Civic Trust offices in the Bishop’s Palace, Church Street, 061 313399 or on the door on each of the nights. Emma Kennedy, Kennedy Analysis, will travel from Zurich to speak about Irish Water and the Shannon to Dublin Pipeline project at the Limerick Civic Trust’s third Annual Lecture Series on Thursday 18 October at St Munchin’s Church, King’s Island, Limerick. She will discuss Ireland’s “decrepit” water pipes and the potential impact of Irish Water’s plans for Parteen Basin and Birdhill. Emma Kennedy is the founder of Kennedy Analysis, whose work in relation to Ireland’s water supply and leakage levels has become well publicised. She appeared before the Joint Committee on Housing, Planning and Local Government in April relation to the proposed Shannon pipeline and also on Prime Time where she highlighted “misleading” statements made by Irish Water to justify the Shannon pipeline and its lack of a plan to prevent water outages in Dublin. The Shannon Pipeline Project – which aims to pipe water from the River Shannon to a reservoir in south Co. Dublin – will involve the abstraction of water from the lower River Shannon at Parteen Basin in Co. Tipperary, with water treatment nearby at Birdhill. The project has been subject to much criticism and opposition, particularly amongst landowners and people concerned with the fisheries. Other speakers in the series include; Colonel Colm Doyle who will deliver his address on 25 October entitled ‘Responsibility to Protect: Sovereignty via Intervention’. Professor Peter Bishop, University College London and Allies & Morrison Architects, will talk about urban design and planning. Conor O’Clery, journalist and writer, completes the line-up. He will share his unique perspective on Russia and Putin’s influence. The lectures will run on Thursday evenings from 11 October to 15 November in St. Munchin’s Church. Lectures start at 8pm and admission is €10 or concessions €8 per lecture. Tickets are available online at eventbrite Tickets are also available from The Limerick Civic Trust offices in the Bishop’s Palace, Church Street, 061 313399 or on the door on each of the nights. Dark nights provide the perfect backdrop for Limerick Civic Trust’s Haunted Halloween Tours taking place from 26 October to 4 November at the ancient Bishop’s Palace on Church Street, King’s Island, Limerick. The crazy ghoulish tours will be held three times daily, 4pm, 5pm and 6pm by Limerick Civic Trust and their chilling friends. Hundreds enjoyed this unnerving experience last year so additional dates have been added. The Haunted Tour is suitable for all ages and takes in the historic Bishop’s Palace building and its ancient cellars through to the old St Munchin’s graveyard. Tales of some spine-tingling characters from Limerick’s medieval quarter are also incorporated. The evening terminates in the church with some old fashioned fun and games for young and old alike to celebrate the Samhain child in all of us. Everyone receives a certificate of completion and all children receive a goodie bag. Dressing up is encouraged! Come join us for this creepy tour of old Limerick. Children free, Adults €7 – limit 2 children per adult. Times: 4pm, 5pm & 6pm. 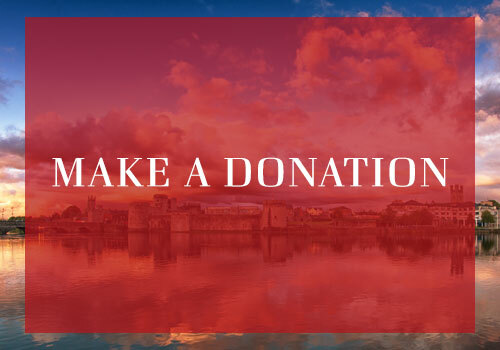 All proceeds will go towards the Limerick Civic Trust restoration fund. Thank you for your support!